Last week I gushed with excitement about working with RH Baby & Child on the start of Chase’s Room makeover. Update: I am still gushing over here because it’s coming together oh-so nicely, hooray! Now it’s time to get serious and talk floor plans. I love a good CAD drawing. Whenever you have the chance to play with a furniture layout, please do. It will often surprise you. Presented with six smart options, I gravitated toward something I hadn’t even thought of. Funny how that works. 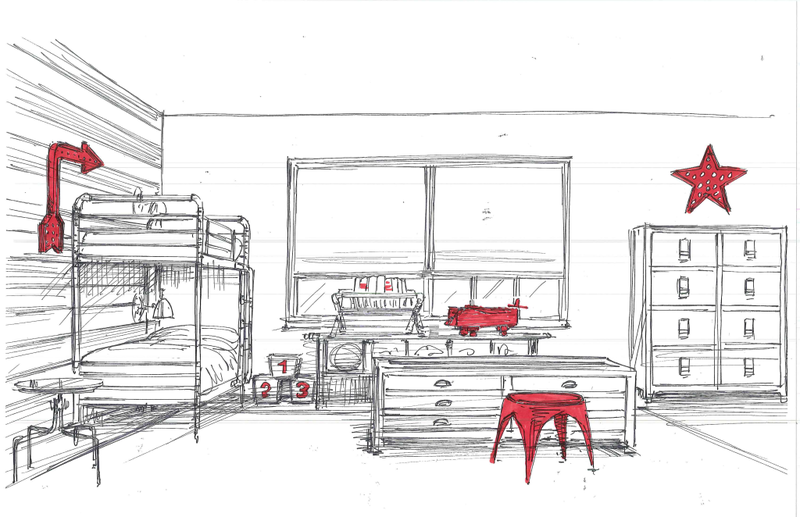 Chase’s original bunk beds were dark and bulky and didn’t make sense placed against a wood wall; nor did it allow for another piece of furniture to fit beside it. The room isn’t exactly large, but given my experience, I know that sometimes adding more furniture, like the play table and stools, can actually make a room look larger. I just LOVE it when that happens. The team at RH Baby & Child had me at “hand drawn sketches.” It’s really telling of their company spirit—their genuine love of design, thoughtfulness and attention to detail, from everyone I encountered. Wow. Leading the design charge was Shay Kos. I liked her sense of style right away and even more when I discovered our boys shared the same name. Shay presented a denim and gray color palette infused with my request—pops of red. She nailed it. So what’s next for #ProjectChase—other than me feeling incredibly envious of a four-year-old’s room and adding the immediate need for a “Master bedroom makeover” to my to-do list? The pallet wall was up. The soft cashmere grey paint brightened the room, and boxes galore lined my driveway. White glove delivery service arrived, and RH designers—the very talented and lovely Darien Stokes and Lauren Hunter—helped me install the room in just a matter of hours. Someone pinch me. See you at next week’s big reveal! Simply gorgeous! I have to say that watching along from the sidelines has been so much fun. The RH Baby & Child team is top notch! Can not wait to see the final design reveal. Chase is one luck boy. P.S. – Frame those sketches they are that cool! FANTASTIC!!! Looking forward to see the finished project and the little boy’s face. I love RH. Everybody is doing a great job! Congrats!